When the republicans show their disapproval of Trump’s tax reform program, USD wend under pressure and EURUSD managed to reach 1.179. Later again, USD was empowered when the secret vote news came out for the next Fed Chair. 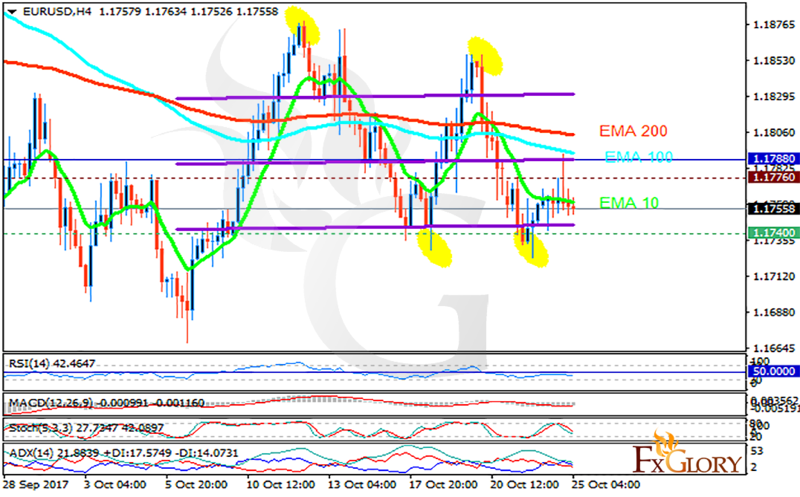 The support rests at 1.17400 with resistance at 1.17760 which both lines are below the weekly pivot point at 1.17880. The EMA of 10 is moving with bearish bias in the horizontal channel and it is below the EMA of 200 and the EMA of 100. The RSI is moving below the 50 level, the Stochastic is moving in low ranges and the MACD indicator is in negative territory. The ADX is showing weak buy signals. There is no clear direction for EURUSD at the moment. The resistance level breakout will push the price to higher levels towards 1.18, otherwise it will decline below 1.17.